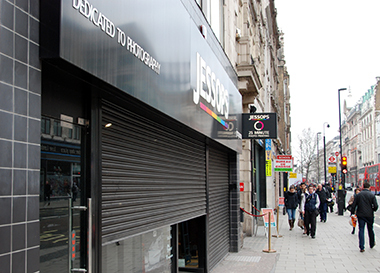 A Jessops store in central London looks set to reopen within days, less than three months after the photographic chain went belly-up and shut all its shops. months ago, has yet to respond to a request for comment left with his PA earlier today. The move would come at the start of the long Easter weekend, traditionally a busy period for retailers, according to the source. This morning, a person inside the shop – based at 129-131 Oxford Street – was seen wearing Jessops-branded clothing, while another unpacked a box of what appeared to be accessories. Around 1,500 staff lost their jobs when Jessops collapsed into administration in early January and closed all 187 stores. Amateur Photographer (AP) understands that at least 28 other Jessops outlets are now being restocked and refitted. Among them is a branch in St Albans, Hertfordshire, according to another informed source. The reports have yet to be confirmed. AP understands that Jones may have struck a deal with the landlord of the Oxford Street property which had been expected to reopen as a souvenir gift shop before the multi-millionaire stepped in. The shutters of the Oxford Street store (pictured) were partly open when AP walked by this morning. Jones is also known to have expressed an interest in opening a Jessops store in Birmingham. However, Jamie Ludlow, a partner at property consultants Prime Retail – which was involved in previous negotiations with Jones over the Birmingham property – said that no deal was agreed. It is not clear whether Jones has since reached a separate agreement with the landlord. In February, AP reported that Jessops stores located on prime sites in London and the Midlands would be targets under a cherry-picking process, if Jessops was reborn as a high-street presence. Companies House documents seen by AP confirm that Peter Jones – who stars in BBC TV series Dragons’ Den – is a director of Jessops Retail, as well as Jessops Europe and Jessops Online. A spokesman for Jessops’ administrator, PwC, said he was not able to comment. However, it is understood that PwC would not have been involved in the latest negotiations with Jones over the lease of the vacant Oxford Street property. A spokesman for Canon which, along with other suppliers, lost millions when Jessops went under, tonight declined to comment. Meanwhile, the flagship Jessops store on nearby New Oxford Street is set to be turned into a Morrisons supermarket.